This summer was supposed to be the year that I start to can. I bought a book, read it, and had a list of recipes I wanted to try. Then I blinked, and summer is suddenly almost over. Big oops. Time definitely got away from me these last few months, and my canning project never quite came to fruition. That being said, I am looking forward to hitting the orchards for their fall bounties and finally getting my feet wet with some canning projects. 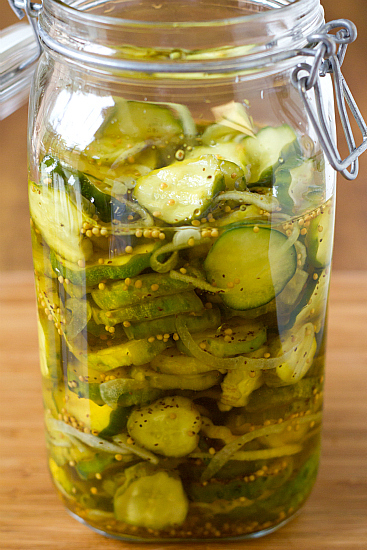 When I saw this recipe for bread and butter pickles, I was immediately drawn to it because you don’t need canning equipment – you could make these pickles (in just about no time) and refrigerate them for two weeks. Score!